They say there’s always room for improvement and in the case of clothing design, it is true. The use of embellishments in the clothes you design can enhance the overall appeal and appearance. If you are adding embroidery to your clothes, consider adding embellishments to them as well. The beautiful combination of embroidery and embellishment can really change the look of the entire design. Some of the sparkly jewels you can add to embroidered clothes include rhinestones, pearls, nail heads, trims, cracked ice or glitter, and more. Once you have chosen the type of embellishments you want to include in the design, you can get in touch with us — USA Beading! If you ask us, we think it is a spectacular idea to embellish embroidered clothes. In fact, we advise you not to go outside of the country to get this done — meaning sending your clothes to China — as we have perfected fabric embellishment techniques and have developed a patented beading technique to provide you with excellent results every time. 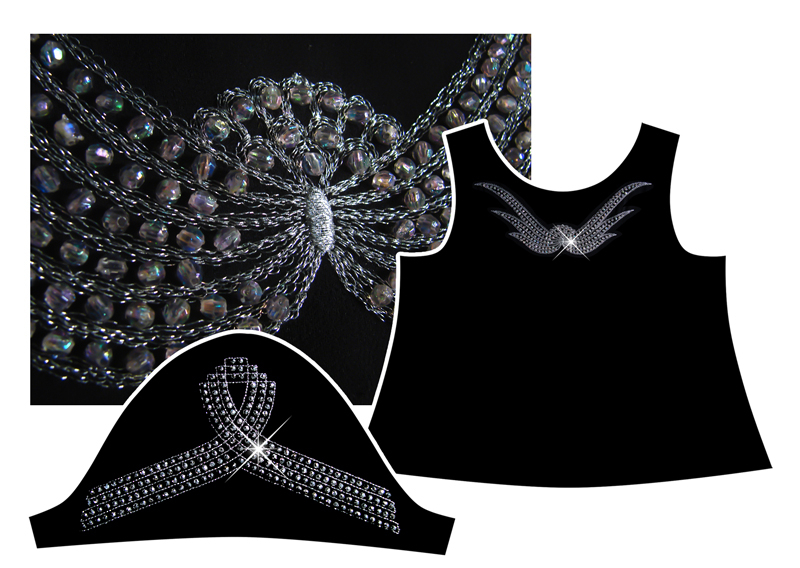 You focus on your clothing designs and we’ll focus on adding embroidery and beading to them! Before you send us your designs, we want to tell you more about on why adding embellishments to embroidery works. You can choose the colors of the beads that go with the colors of the embroidery. You can create a diverse range of embroidered patterns that incorporate beads. For instance, if you want to create a floral embroidered pattern. In the center of the flowers or around them, you can add beads. Better yet, you can create patterns using only beads and enhance it using embroidery because the reverse of this is just as good as adding embellishments to embroidery. If your clothing line consists of mainly dark colored fabric, you can add a pop of color to them by designing colorful patterns using embroidery and beading. Use shades of orange, red, yellow, pink, and other brighter shades. If you want, you can opt for sparkly beads or cracked ice or rhinestones so when the sun shines on them, they sparkle under the light. You have created a shirt, but it looks ordinary. It looks like all the other shirts you see in retail stores. However, you want to do something different. Something out of the box so it looks different from the rest. What you can do is take a plain shirt and enhance it with embroidered patterns with embellishments. Now, do not fill the shirt with these designs, but add them around the neckline, shoulder, bottom of the shirt, or back or front of the shirt. In short, add embroidery and beading in a place that enhances the shirt’s design, not takes away from it. Have we convinced you to add embellishments to embroidery to enhance your clothing design? If we have, contact USA Beading for our domestic fabric decorating service.